It’s been a while since I blogged about Z’s milestones. He’s turning 3 in less than a month’s time (man, where did time go?) and has been working hard to get where he is now. I’ve checked my old posts and the last one I posted about what Z can do was this January. Since then, Z has accomplished quite a lot, I would say. 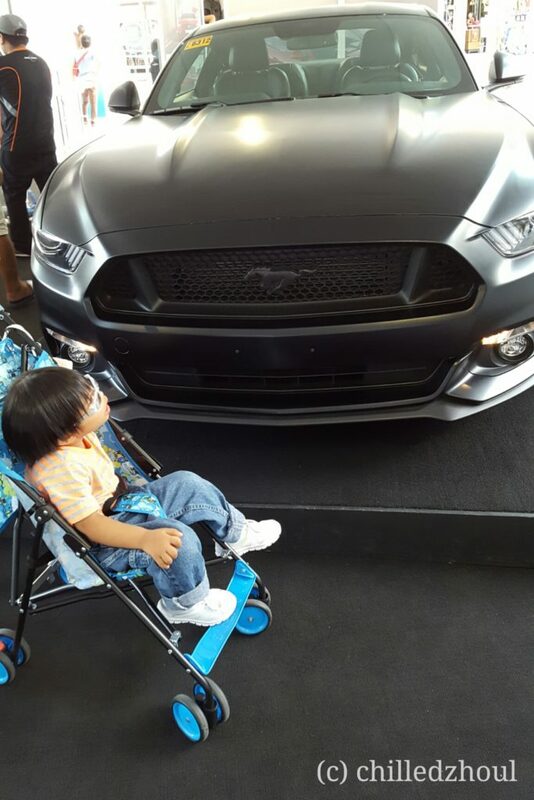 Last June, Z had his consultation with his Development-Pedia. We consult with him every 6 months to check and assess where Z is already in terms of his development. During his November 2015 consultation, at 2 years 3 months old, Z was said to be the equivalent of an 11-12 month old baby in terms of development. After 6-7 months, he progressed a bit. He’s now at 12-14 month old equivalent. Slow progress is still good progress in this case. So, at 35 months old, Z is still non-verbal. He could run, but still lacking balance. He still needs help removing and putting on his clothes, he still needs help feeding himself, he is still not potty trained and could not tell us (in his own way) if he needs to pee or poop, he can’t drink from a cup by himself yet, he can’t go up or down the stairs on his own. 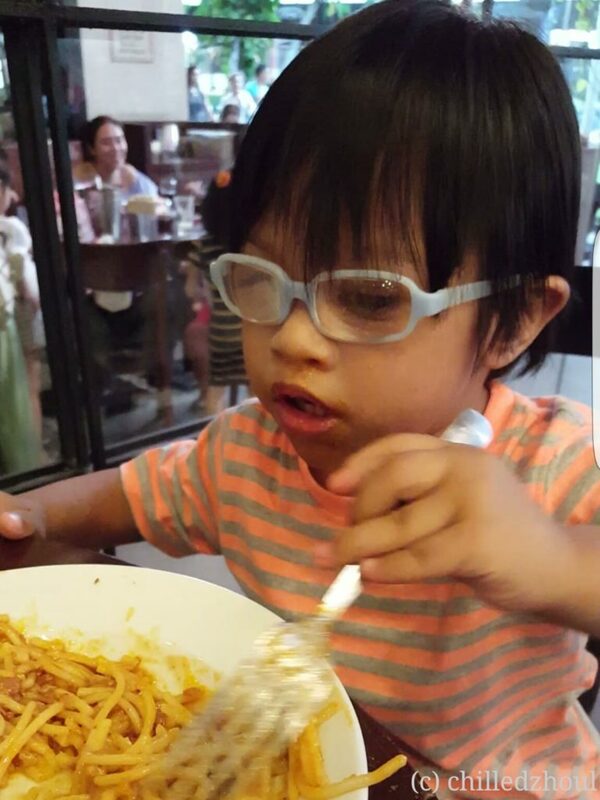 But, at 35 months old, he is not a picky eater. He eats vegetables, meat and fish (even ampalaya, he eats it, I swear!). He doesn’t eat junk food, processed food, sweets or even drink artificial juice drinks. He loves pasta. Red sauce, white sauce, as long as it’s pasta, he will eat it (with the exemption of spicy one). At 35 months old, he is now weaned from bottle feeding (using bottle teats). He mostly drinks milk and water from his training cup or sippy cup. On the rare days when his cups aren’t yet washed, he drinks milk from a bottle with a spout (which happens about twice in a week). 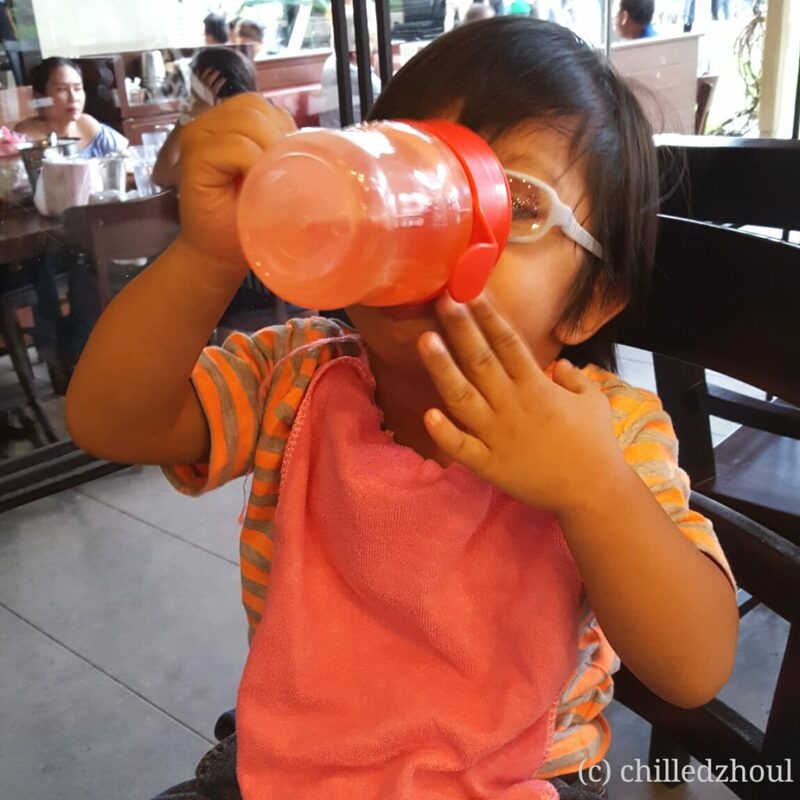 I am now planning to transition him to using a regular cup and using a straw (drinking using a straw helps in muscle development in the mouth). 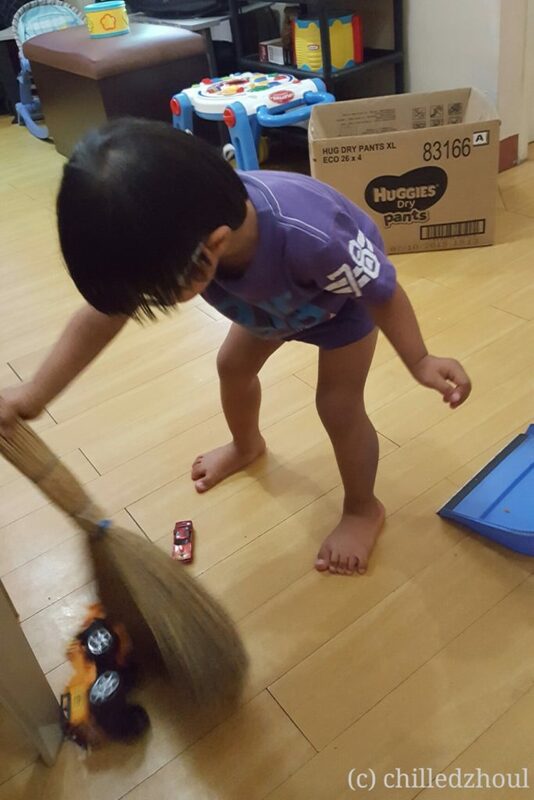 At 35 months old, Z knows what the broom is for. He also almost always tries to get this from his nanny whenever she is sweeping the floor. Z wanted to do the sweeping instead. 🙂 Well, at least, as early as now, he is learning that he needs a clean space. LOL! 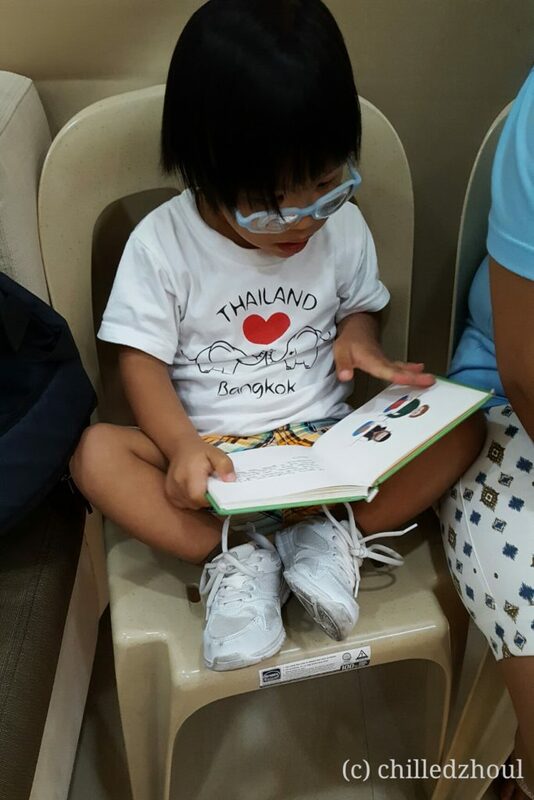 At 35 months old, apart from cars, Z is consistently showing a love for books. Everytime he sees one, he would get it, find a good spot to sit on, and turn the pages, as if he can read every word written. Even at home, when he sees one of his mutilated books, he would pick one up, and “read” it. He owns a few picture books and could identify a few of the things in it. For example, one of his mutilated books is all about cars. In one of the pages is a picture of a school bus. And everytime he sees it, he would do the actions to the song, “The Wheels on the Bus”. 🙂 He has been practicing saying the word “car” as well. I think it is actually his very first word. There was one morning a few months ago when he pointed to the picture of a red car in his book and said, “ca”. 🙂 He says it every now and then as well but not when you are asking him to say the word. 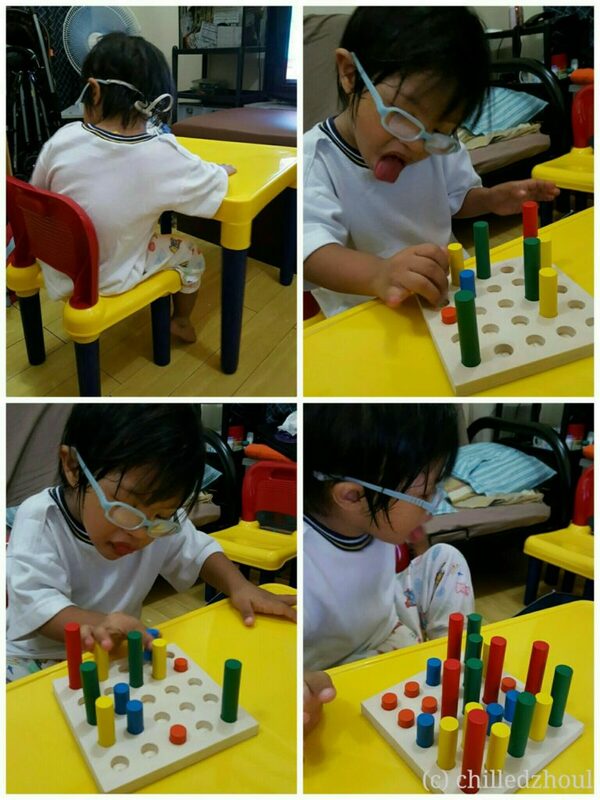 At 35 months, at his regular physical therapy sessions, he has been showing a lot of improvement. It was just March this year when he could barely climb any platform at first attempt. He could not complete an obstacle course comprising of different textured steps, low and elevated paths, or even run for that matter. Now, he can finish his obstacle courses with confidence (so long as he is not feeling lazy at the time), he climbs up the ladder of the slide, walk through what I call “the barracks” prior to sliding down. 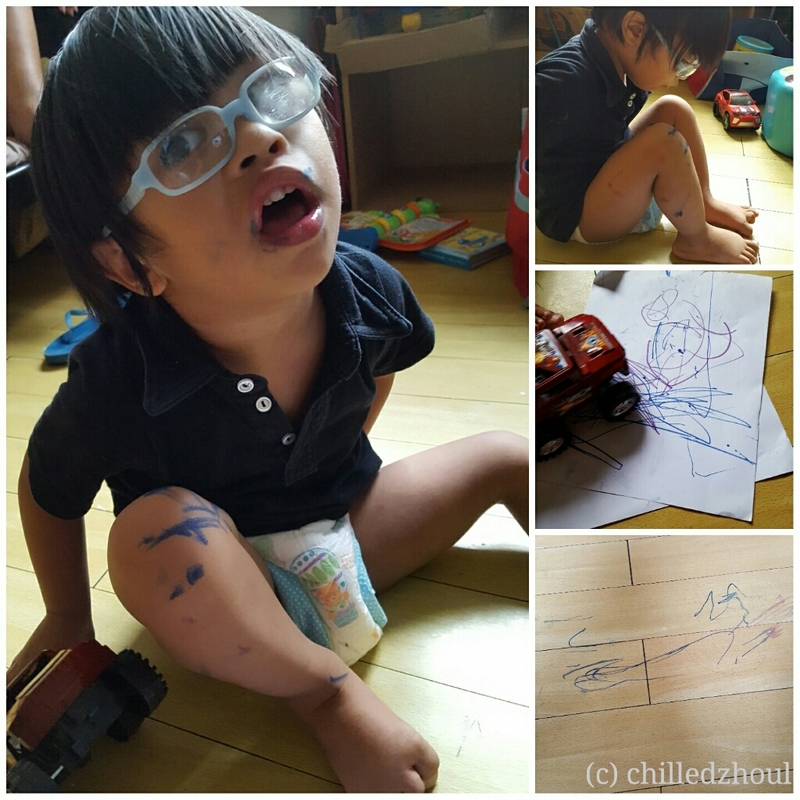 At 35 months, Z has also started working on writing (doodling, actually) on paper. He’s getting himself familiarized with how to hold a pen or a crayon, how to run the pen across the paper (or the floor, or his leg, for that matter). Even in his occupational therapy sessions, writing has also been introduced to him. His work doesn’t stop after therapy sessions. He works on his activities at home, too. At 35 months, he is starting to string together syllables, attempts to say a word, but will let you know in his own way what he wants. He knows when he is being scolded, he would cry and throw his toys around when he is mad or frustrated, he loves the sound of sizzling stuff being sauteed (he would walk to the kitchen and try to see what’s cooking), he can understand simple instructions (close the door, give [whatever he is holding at the moment], wipe the mouth, etc). He’s starting to associate time with the shows he regularly watch (he knows when it’s time for Hi5 😀 ), he gets his towel when he knows it’s almost bath time or if he wants to take a bath and he goes straight to the room right after so he can put clean clothes on. He imitates actions (especially when watching Hi5 songs) and will follow actions to songs. We are now introducing one action song per week and still ensure that he will not forget the rest of the songs that he learned. What am I trying to say here? Z can do a lot of things and can understand a lot of things that I think are not really being considered during medical assessments. While I am grateful that we have a very good doctor watching out for him, I truly believe that Z is developing in ways that can never be assessed by mere consultation alone. He is progressing the way that he should but that does not mean, too, that I start to ignore the recommendations in the medical field.